Matzo balls are one of my favorite Passover foods. They’re usually made with “regular” matzo meal, which is simply plain matzo (made with refined flour) that’s been ground back up into a rough flour. Whole wheat matzo meal, then, is just whole wheat matzo that’s been ground back up into a rough flour. The trick is, it can be hard to find at the store — especially if you don’t plan ahead, like me. I went to two grocery stores this morning, and to my dismay couldn’t find any whole wheat matzo meal (Seriously? On the Westside?!). 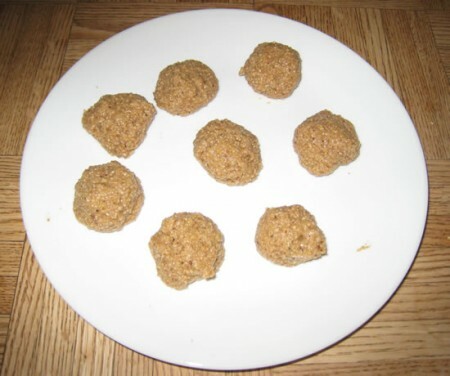 Luckily, my mom had some in her pantry already, so she volunteered to make a special batch of whole wheat matzo balls for me, using our family recipe (which, umm, came from the side of the matzo meal box, many years ago). I’d like to thank my Mom for (1) going the extra mile to accommodate my dietary preferences, and (2) taking these pics of the matzo-ball-making process so I could share them with all of you. I’m definitely looking forward to gobbling these up in a couple of hours. Happy Passover, everyone! These delicious matzo balls make me look forward to the Passover season as I just can't seem to get enough of these! Mix oil and eggs together in a medium bowl. In a small bowl, combine matzo meal and salt, then mix into the oil-egg mixture. When well blended, add soup stock or water. Cover and place mixture in the refrigerator for at least twenty minutes. Form the mixture into golf-ball sized balls. Using a two or three quart pot, bring salted water to a brisk boil. Reduce heat, then gently drop balls into simmering water. Cover pot and cook 30-40 min. While they're boiling, prepare another pot of soup (traditionally chicken, but I use veggie stock). 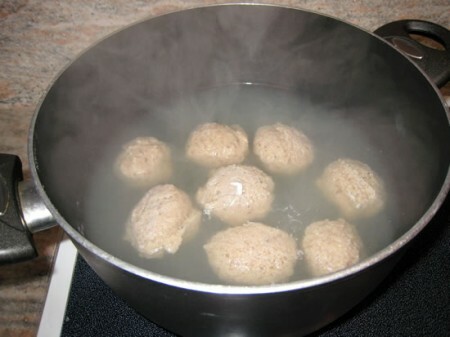 Once the matzo balls are done cooking, use a slotted spoon to transfer them from water to soup pot. When ready to serve, allow soup to simmer for about five minutes. Serve with carrots and parsnip, or similar root vegetables. Garnish with parsley, of course. Looking for more matzo recipes? Check out this fun post at Leite’s Culinaria: Matzoh-Paloozah: 100 Matzo Ideas (really). Hi Andrew! It’s your “blogging mom” checking in to say Happy Passover. I must admit, when I read your tweet out loud, my daughter groaned a bit about the whole wheat. Though I don’t see why the whole wheat matzo ground up like the regular refined stuff wouldn’t work just as well. In our house, the trick is some seltzer water for the fluffiness. Regardless, you mom totally rocks for doing this for you. Tell her to have a wonderful Pesach from me. I’ll be at my sister-in-laws with desserts in tow eating her matzo balls this evening. See you at BlogHerFood? Thanks, Beth! Yup, I”ll be at BlogHer Food — I’m going to be speaking on a panel, too! Values: Food Blogging for Change. I’ll certainly pass along your Pesach message to mom, and happy Passover to you, too! Is there a reason don’t you cook them in the soup broth along with everything else? I’ll look for whole wheat meal next time I’m buying it…thanks! Good question. I’ll ask mom and get back to you. My first response was that the matzo balls pick us a yellow tinge from chicken soup, but then decided to look online and see what others wrote. These answers are what struck me (from Chowhound http://chowhound.chow.com/topics/480002): Shayna Madel says: Cooking the balls in the soup makes the soup starchy and therefore cloudy, though I assume it adds flavor to the balls, so I guess it’s personal choice. I agree on cooking in salted water. The key on this is that if you over-salt the water, the salt in the water gets drawn into the balls and the balls are too salty. 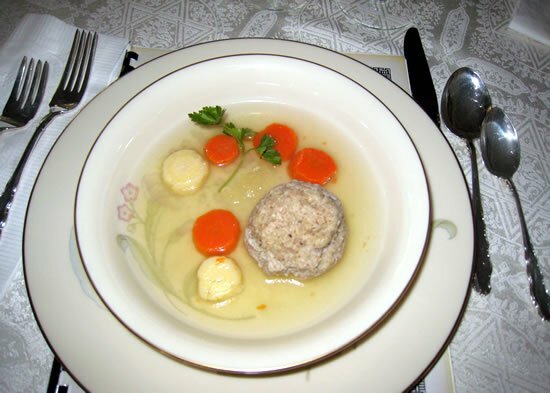 And Nyleve says: I always cook in plain water, not stock, because the homemade chicken broth will always end up being served clear, with the matzoh balls. And cooking the MBs in it will cloudy the broth and absorb quite a lot of it.